(Updated: In an earlier version of this post, I couldn’t recall the name of the children’s book I reference throughout. I offered a $25 reward, payable to the sleuth’s charity of choice, for anyone who could help me. In less than a day, one of our readers emailed me the title “The Creature Department”. A couple of years ago, our oldest daughter (maybe nine-years-old at the time) brought home a library book, “The Creature Department” by Robert Paul Weston and read aloud a now-favorite section. She thought it was funny; I thought it was eye-opening. “You name them?” asked Elliot. Elliot and Leslie weren’t quite sure they were ready to start naming their troubles, but like a lot of things in creaturedom, the practice made an odd sort of sense. Below, we will walk through some recent market updates, but also some timeless truths about “ze pain” of market corrections and how we think all investors should greet market risk like an old friend and companion (“A strange one, perhaps, but a companion none-ze-less”). While this is supposed to be a 3rd Quarter Market Commentary, most of the investing headlines have bled over into these first two weeks of the 4th Quarter. Starting September 21st, the S&P 500 has dropped roughly 6%. To put that in perspective, picture someone who has dutifully maxed out their 401k for the last two years at $18,000 per year. If they had $600,000 invested in US Stocks, they would have seen their previous two years of contributions wiped out by the recent correction. That is hard to stomach. Market corrections, just like the pain of lost love, will inevitably come knocking and we have a choice of how we respond. Over the past 30 years, U.S. equities have outperformed the rest of the world by more than 17% over a prolonged (5-month) period a handful of times. The chart above illustrates specific “pain” that has shown up uninvited: the pain of diversification. Particularly the pain of owning non-US assets. Only eight times in the past have we seen US Stocks outperform the Rest of the World (RoW) to this degree. This disparity is a rare occurrence, but it is enough to make diversifiers begin to doubt themselves. We have seen a similar, but possibly less surprising, effect in the bond market. 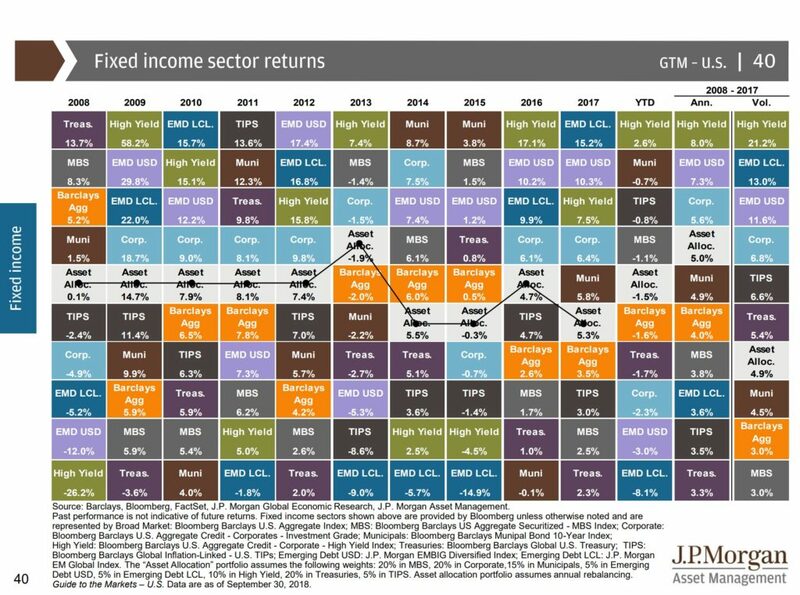 In the graphic below, you can see that for only the second time in a decade, every sector of bond funds (except the most “stock-like” high yield) is down for the year. This decline isn’t surprising; we’ve been mentioning this as a likelihood due to rising interest rates. But it doesn’t make it any more palatable. In the YTD column, US Small and Large Caps have led the way with Developed Market Equity (-1.0%), Fixed Income (-1.6%), and Emerging Market Equities (-7.4%) trailing behind. This sort of performance (along with the accompanying thoughts “well I could have told you that would happen”) can lead many investors to question the benefits of diversification. But this questioning is exactly why we need diversification and exactly why it makes works! Nick Maggiulli, Of Dollars and Data, posted a great piece about “Why The Greatest Predictor of Future Stock Market Returns is Useless.” The basic premise of his post (a must read) is that even when someone is presented with a reasonable method for investing which has outperformed the market, the emotional cost of doing something different could lead to unbearable outcomes (similar to the study we mentioned, “Even God Would Get Fired as an Active Manager” in our Q2 2017 Market Commentary). 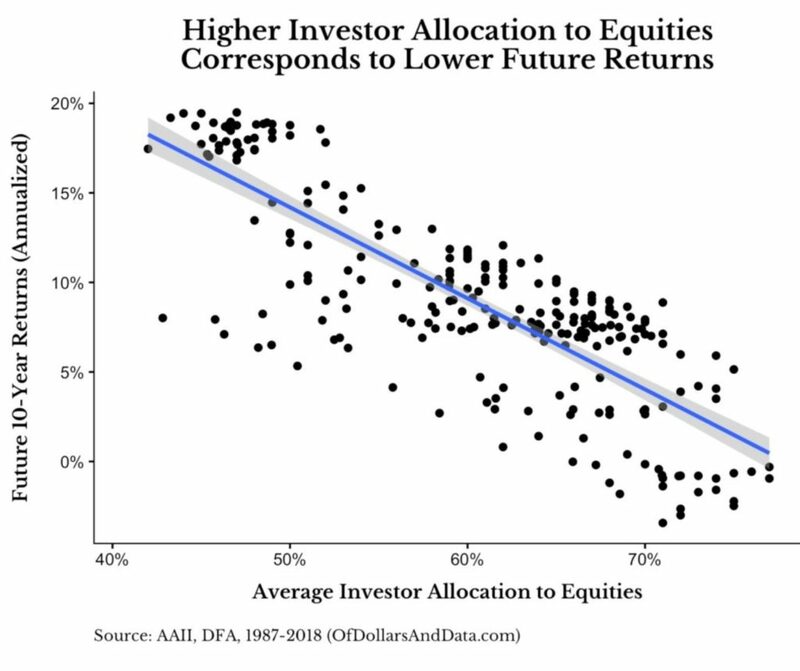 Somewhat beside his main point, Maggiulli displays a fascinating chart that details the inverse relationship between the average investor’s allocation to stocks versus the future 10-year investment growth of stocks from that point. The data shows that over the last 30 years, as investors own a higher percentage of stocks in their portfolios, they tend to experience worse returns. For example, when the average investor’s portfolio has hovered around 70% stocks, their growth for the next 10 years has been ~5% annually. But when the average investor’s allocation to stocks has dipped below 50%, their future growth has tended to be dramatically higher. In simple terms, as more investors feel like Stocks (the US in particular) are “can’t miss” investments and they no longer see a reason to diversify, that tends to be about the time that they experience lower future returns (and diversifying would have been beneficial). We have two solutions to investing through market fluctuation. 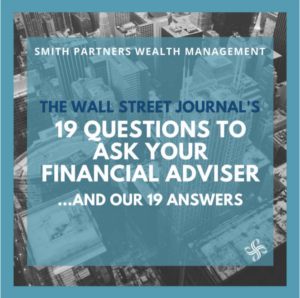 The first (jokingly) would be for all investors to ask their custodians, 401k providers, and financial advisors to simply “white-out” on their statement any periods of decline. 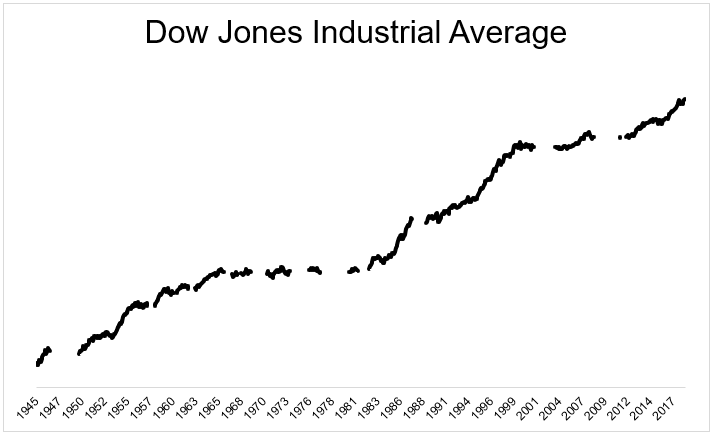 The result, over time, would look something like this chart (via Michael Batnick at The Irrelevant Investor). For investors on the other end of the time spectrum, they should also genuinely greet these market corrections as “old friends”…because they are. If an investor has retired with a portfolio sufficient enough to sustain their lifetime, it is likely because of market risk (corrections), not in spite of it. In other words, volatility is and has been our friend. In fact, without the possibility of risk, most retirees today would not be retired. For example, what if an investor started with $302,000 in 2003 and had the choice between a) a diversified asset allocation portfolio (the grey boxes in the patchwork chart above) and b) a fixed income portfolio (the blue boxes). Using JP Morgan’s return figures, the less risky Fixed Income portfolio would have only declined two years (including 2018) and would have returned 4.1% annually. 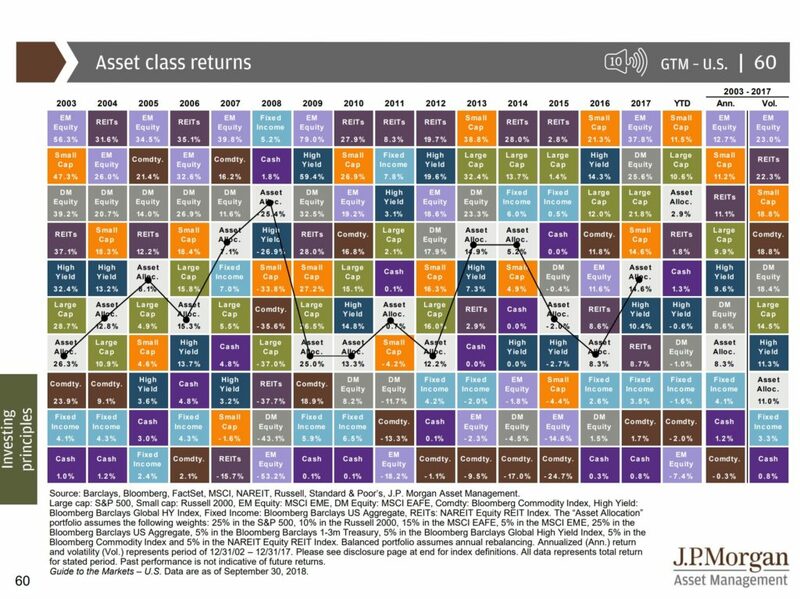 The Asset Allocation portfolio would have had much larger swings (even losing ~$140,000 in 2008!) but would have ended the 15 year period with an 8.3% annualized return. So after opening 180 monthly statements, the investor who took on both the potential and the actual pain of market declines would have ~$500,000 more in her account. Talk about an “old friend” indeed. Knowing full well that financial planning is about far more than numbers, Justin loves to help clients walk through both the routine and the significant decisions in life. While he could have been perfectly happy with a career as a mathematician or counselor; he is delighted to get to be both...often within the same meeting or even sentence. Justin thrives on being able to transform complex financial and relational issues into practical plans and clear action steps.